Owing to the vast experience in this domain, we have been able to offer high quality Decorative Glass Partition to our valuable customers. Manufactured in accordance with the international quality standards, these partitions are widely used for various decorating interiors applications. 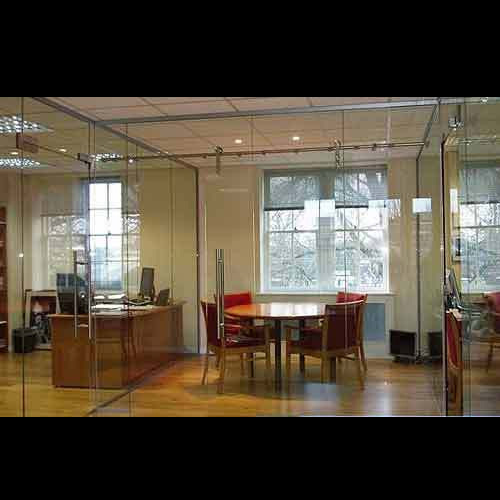 As per the specifications provided by our prestigious customers, these partitions can be custom made. Established in 2012, we, "D Kumar Lamituff Glasses (P) Ltd. "are a sole proprietorship firm that are engaged in the manufacturing, trading, wholesaling and exporting of a massive range of Safety Glasses and Folding Wardrobes. We are also provided Interior Designing Services. The extensive range of products offered by us is inclusive of Acid Etched Glasses, UV Printed Glass Designs and Safety Glasses. Extensively used in windows, doors and ships, the entire range of the products offered by us is highly acclaimed among our revered clients spread round the globe. Relying on the prudent vendors for premium quality raw materials, we manufacture the whole range of the products offered using high-grade raw materials. The offered products are manufactured under the stringent supervision of the experts. Committed to offer a range of utmost quality products, our team of quality controllers checks the whole range of the products on various parameters and hence assures a range of invincible quality for our clients. Owing to the quality of the products we offer, we have garnered words of intense praise among the client-base we have accomplished to acquire so far.